Lupe played by Sara Lopez recites her lines during rehearsals for the production of "The Tragic Corrido of Romeo and Lupe" at the Pharr Community Theater Wednesday, April 18, 2018, in Pharr. PHARR — While studying the history of the Rio Grande Valley to write an adaptation to a Shakespearean play, Seres Jaime Magaña racked up some hefty library fines. Rather than being set in 14th century Europe, Magaña’s version takes place in South Texas set in WWII era and opens with a corrido. Rap battles are weaved throughout. “I decided I was going to experiment” he said. “There was a lot of research involved. 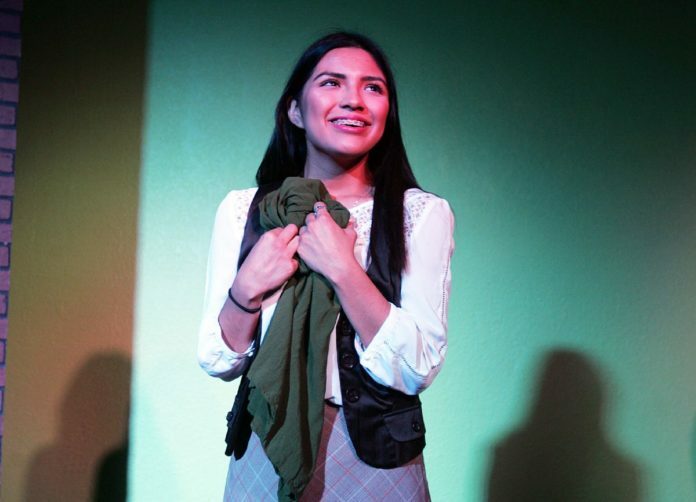 After eight weeks and hundreds of hours dedicated to rehearsal, “The Tragic Corrido of Romeo and Lupe” makes its world premiere at the Pharr Community Theater. In this tale the conflict between the star-crossed lovers is due to their differing backgrounds — one from the family owning the land on which other does farm work. Staying true to the spiritual symbolism of the original play, however, was important to Magaña. In adding his spin, he changed the name of Juliet to Lupe as a nod to the Virgen de Guadalupe. The scriptwriter/poet has lived in South Texas since he was 10 and began taking theater classes with the play’s director, Pedro Garcia, at 14. Garcia approached Magaña with the idea and soon the details began falling in place. Both veteran and amateur actors, filling roughly 20 roles, appear in the production. “The talent involved comes from all over the Valley,” Garcia said. For Francisco Crisanto of McAllen, this is his seventh play with the local theater. But performing in a Shakespearean drama, he said, has always been a goal in his acting career. Spanish was Crisanto’s first language and upon reading the script— which Garcia estimates includes about 30 percent Spanish dialogue — he was all the more convinced to try out for the role of Lupe’s father. While the three-hour Monday through Friday evening practices often run longer, he recites his lines with a continued enthusiasm and conviction. Magaña’s involvement extends beyond developing the script. Starring as Padre Lauro, he weds the star-crossed lovers. “For anyone looking to become an actor or not, community theater offers a space for growth,” said Magaña. Developing discipline, overcoming nervousness and learning to step outside one’s personal bubble, he said, are some of the ways in which theater builds character. The tragedy, Magaña said, was written to transcend its life as a play and unveil something “fresh” or different with each performance. The show opens Thursday and runs through April 29. Tickets are $8 general admission with a discount for students, veterans and senior citizens. To purchase advance tickets, call (956) 239-0412.